Ultraportables, ultrabooks, netbooks, hybrid tablets: the small, light and portable end of the market is a crowded place, and while many attempts to make a low-cost and low-power champion have come and gone, no laptop since the original Eee PC has been able to carve a niche in this, the toughest of all battles. The Samsung Series 5 Chromebook XE550C22 is the latest low-cost, portable laptop aimed at those who love to browse, email and work on the move. It's a 12.1-inch laptop, that competes with the likes of the Asus EeePC 1025PX, Asus Transformer Pad and MacBook Air 11-inch. The Samsung Chromebook ditches Windows in favour of an operating system built around the Chrome browser. It's the end product of an always-connected utopian vision, where the laptop is just a gateway to your information via cloud apps and services. However, when the first Chromebook (XE500C21) launched last year, the world wasn't ready, and it flopped. Hard. Now it's back with a makeover, but can it do better the second time around? As an ultraportable laptop, the Samsung Series 5 Chromebook looks great. The design is born out of recent Samsung success stories, and you can see hallmarks of the Series 5 Ultrabook here in the colour, keys and shape. There's even evidence of the Samsung Series 9 in the screen and neat closable Ethernet port on the left hand side. For a laptop that costs just £379, the Samsung is solid and well built. The keys have just the right about of travel, are well-spaced and easy to type on. You can easily bash out a long document without any hassle, and the track pad has also been upgraded from the dismal offering on the previous model. 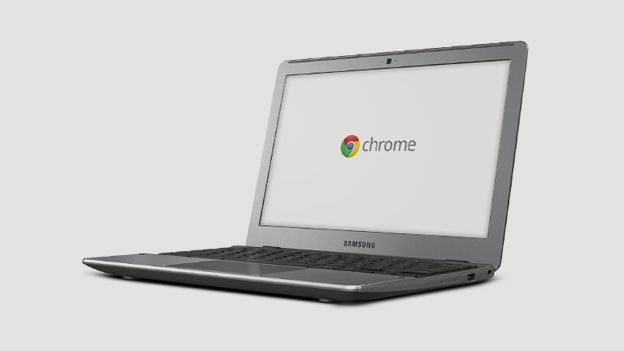 The main feature of the Samsung Chromebook Series 5 is Chrome OS, Google's own operating system. The last iteration failed due to it reliance on an internet connection to access email, documents, files and apps. Google has alleviated this issue in its revision of the OS, but Chrome OS is still frustratingly limited. Chromebook, but you can't add it to your desktop, copy it to a separate device, or even upload it to Google Docs. Limiting isn't the right description; debilitating is more apt. Because Chrome OS is such a lightweight OS, stacks power isn't necessary here so there's a meagre Intel Celeron 1.3GHz processor at its heart. Elsewhere there's 4GB of RAM, which is huge for a laptop of this type, and a 16GB SSD hard drive. This technology means that the Chromebook will turn on in just 3 seconds, and because all storage is done in the cloud, bar a few apps, only minimal space is needed. There's also a front facing 1MP web cam capable of 720p HD video capture for video calling and web chatting. The Samsung Chromebook packs in a 12.1-inch screen, that's got a non-reflective coating that makes it possible to work in bright conditions without dazzling reflections. The screen is a standout feature, and packing 1,280 x 600 pixels into such a small space means everything looks sharp and detailed. The panel is also 300nit, which means it's brighter than your average laptop, but this doesn't translate into good colour reproduction. We found visuals to be extremely washed out with blacks appearing light grey in places, but let's be clear: this laptop is not designed for media, so if poor video performance is a major problem, you should quickly look elsewhere. Browsing the Chrome OS, loading web pages and even watching high definition YouTube clips went without a hitch. 1080p clips loaded quickly and although we noticed frame-rates dropping slightly in busier scenes, it wasn't enough to ruin our enjoyment of Kanye West's Runaway. Our traditional benchmarking software isn't Chrome OS compatible, so we had to rely on SunSpider to measure the web page rendering capability. A score of 471.3ms showed it's no slouch on web browsing, but while playing some of the basic games from the app store, we noticed frame rates significantly struggling. Even Angry Birds was a less than smooth experience, and that's disappointing. That story continued as we loaded some video files. The Chromebook struggled to play most formats with the notable exception of MP4, which it handled with aplomb. A standard definition .AVI file was reduced to aseries of still images, proving further that the Chromebook is simply not designed for media. Battery tests yielded excellent results, and this is where the solid-state drive and low power processor really come into play. We looked a HD video, streamed from YouTube for over 4 hours before the Samsung Chromebook died. With such a great performance under heavy strain- and believe us, it was strained- you could easily get a day's use out of this ultraportable laptop - and stat which saves the Chromebook many of its blushes. The Samsung Series 5 Chromebook is a great ultraportable laptop, that's been made with love, experience and careful design. However, the disadvantages of Chrome OS over Windows make it impossible to recommend. Despite the battery life improvements, the Asus Eee PC 1015PX is better value, just as usable, more powerful, and works when you're away from the internet. If Google comes back for a third attempt, we really hope it's with Android, and the great Chrome OS experiment is put down to experience.